Thirty-two years ago, I found out the true benefits which accompany massage. 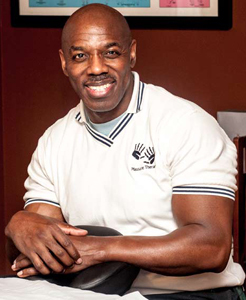 One of my best friends, Stanley Mason of Saint Thomas, US Virgin Islands, received his massage therapist certification from a school in Florida. As a way to promote his services, Stanley gave free massage sessions. As an avid weightlifter, swimmer and former competitive bodybuilder, the benefits of massage quickly became clear to me. By the time I started receiving therapy, my biceps had the painful sensations of what I can only describe as electrical shocks. These so-called shocks hampered my workout potential and were truly annoying. Stanly would utilize deep-tissue and neuromuscular massage techniques. Only then was I able to find relief from this particular discomfort. I’m over 50 and I receive a professional massage at least once a month. Massage plays an important role in my fitness and health regiment. Massage also helps my muscles recuperate from strenuous workouts and helps me relax. Personally, I am on a holistic journey. Massage has opened my eyes to alternative medicines. Future plans include more classes in muscle dysfuntion, specifically in resolving pain of the neck and lower back. As a nationally certified massage therapist, I am required to take continuing education courses and over the years have done so. In fact, Ive taken more than the usual amount to secure my license remains in good standing. My certifications include, Table Top Thai massage, Facial massage with essential oils and numerous NMT advance classes. My massage sessions are custom tailored combining a wide range of modalities. These Modalities may include utilize Swedish, shiatsu, friction, stretching, neuromuscular techniques, hot stones, Thai, aromatherapy, deep tissue & reflexology to help my patients attain his/her goals. Each massage session starts with an interview. Questions are asked, forms are filled out and S.O.A.P. notes are taken. Feedback is important. If very deep massage or light work is needed, just ask. My massage session can be very quite but, if you feel you want to talk you can. I am a great listener and talking during the session can be very therapeutic in itself. I am very comfortable working with guests who seek pure relaxation, guests who seek specific therapeutic benefits, and guests who wish to understand the creative, and the spiritual dimensions of massage. Massage is powerful. There is a spiritual energy in massage. I believe that massage can heal and that there is power in touch. I have been a member of American Massage Therapy Association (A.M.T.A.) since 2003. I have high ethical standards. I respect all my guests no matter their color, beliefs, sexual orientation etc., and I EXPECT the same. Hope to see you on my table soon.